And Schultz crafted his business’s name very carefully. He weighed branding options, connected to business partners and inundated his market with advertising pieces. 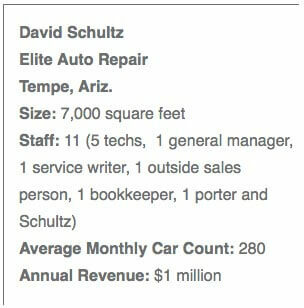 By the time he sold Elite Collision Center to a consolidator in 2011, the brand was a local, Tempe, Ariz. staple. No, you read that right. The business Schultz poured his effort into was his now-sold collision repair shop. 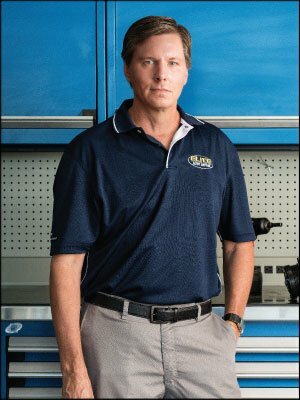 His mechanical business—which operated next door, literally in the collision shop’s shadow—was simply an afterthought. And it never established itself, at least in customers’ minds, as a separate business. “Everyone just thought our collision business performed [the mechanical] work we did,” he says. As the collision industry became increasingly difficult to turn a profit in, Schultz was presented with a generous offer for the business. With a mechanical shop still under his control, he decided to take the money from the body shop and invest heavily in transforming the service center. Roughly 12 years behind on his marketing, Schultz determined that becoming a NAPA franchise would be his best route. He spent a year overhauling the shop’s appearance, changing out equipment and completely rebranding his marketing strategies. Sales were “so-so,” Schultz says, hovering around an $800,000-per-year pace. And the shop fought a negative reputation brought on from other NAPA centers in the area. In 2012, Schultz decided the shop needed another makeover. 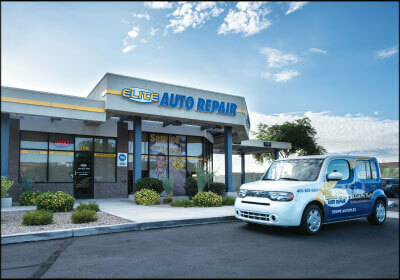 Schultz decided to go back to the Elite Auto Repair name, repaint the shop and put in new signage. He wanted to give the shop a “one-off look” that ensured customers it was not a franchise. He put in custom artwork that included furniture made out of old road signs by an artist in New York. He also entirely redid the business’s marketing approach. They began targeting customer demographics (looking for middle-class families with vehicles out of warranty) with direct mail, joining “conquest” mailer programs, adopting customer acquisition and retention systems from Demandforce and Constant Contact, and even utilizing a turn-key mobile application service that provided the shop an app-based customer rewards system. In all, Schultz guesses he spent $30,000 in the rebranding effort. And it quickly paid off. With the new brand hitting its stride, sales rose 20 percent over a 12-month period ending in mid-2014. Schultz expects it to continue to rise, and he credits it all to his new brand.